Alfred John Smith(centre) and his staff: Cheapside 1938. Click on the image to open a large version in a new window. 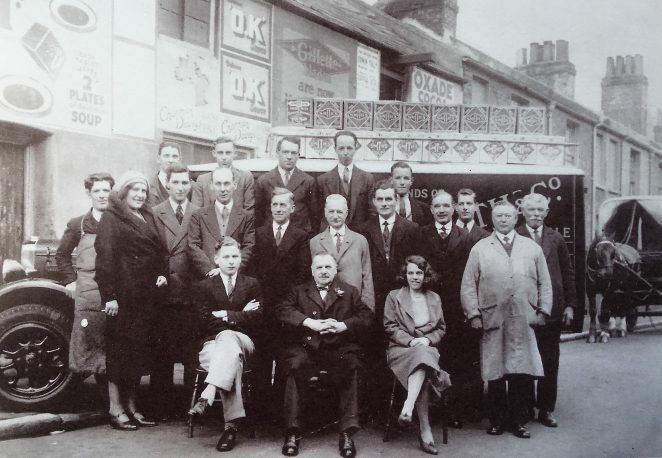 This photograph dated 1938, shows my grandfather Alfred John Smith, who was a wholesale grocer, together with his staff in Cheapside, off London Road. The street numbers of his business premises were 43, 45, 46 and 47. They were situated between Belmont Street and St Peters Street. He bought number 43 the former Belmont Arms public house, which shut down in 1932. I remember the old Smith’s Crisps tins in the photo. When I was a youngster some of us lads who worked for a local grocery firm used to have friendly mucking about competitions to see who could carry the highest load of tins two abreast. The idea was to really clamp your hands tight on the bottom of a stack of tins and lift them from the ground, if you made it the the other lads just piled more on ’till you weakened or lost your balance. If the lot toppled then you were on your own as for sure the boss heard the clatter of tins and would come looking to see who was going to get earache, the other lads would be long gone. The three people sitting down in the picture above from left to right are: Reginald Smith, son, Alfred John Smith and Winnie, his daughter. I would love to know the names of his staff behind him – can anybody help? He started trading in the street (cheapside) in 1902 when he bought number 46 from Thomas David Tully, a furniture dealer. In 1918 he expanded the business and bought number 47 from James Frederick Tully, a baker. A few years later he bought two more properties which included the old Belmont Arms public house, the whole business was situated between Belmont St and St Peters St. Does anybody remember him? In his later years, although he was a wholesale grocer, he was heavily involved in Smiths Crisps, he was the main distributor for the area. He died in 1941 leaving the firm to his son Reginald. This is were it get a bit sketchy, he sold the business in the fiftys; he was worried about the compulsory purchase orders in the surrounding areas which he thought would affect his buildings, the business was trading till 1961. The irony is the buildings are still there today. Please help with some names. Thank you.